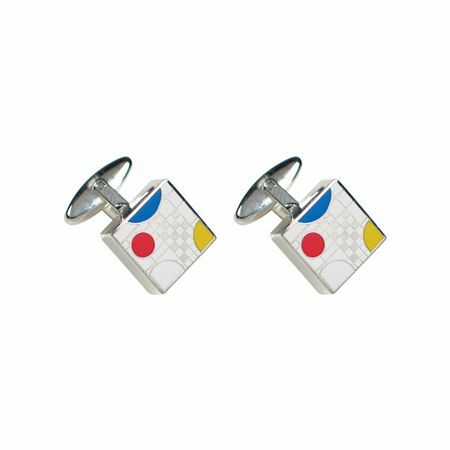 Order your Acme Frank Lloyd Wright Inspired White Playhouse Cufflinks today from FahrneysPens.com. Fine Pens, Refills & Luxurious Gifts – great prices & fast shipping. The new Playhouse White is based on a well-known design by legendary architect, Frank Lloyd Wright, proudly brought to you by ACME Studio. The design has silver line work with red, yellow and blue accents on a white background that is reminiscent of the windows in the child’s playhouse designed by Wright for Avery Coonley in the suburbs of Chicago - representing balloons and confetti in a Fourth of July parade. The cufflinks made of cast zinc alloy with colored enamel. The ACME logo is engraved on the back. Packaged in an ACME flanel pouch with the designer's bio card.